Solomon Henry Jackson was born in late 1700s England to parents of Sephardic origin. At a young age he immigrated to the United States, settling in Pennsylvania where he got married. Noticing a great lack of Jewish texts in the New World, Jackson moved to New York and established the first Hebrew printing press in the country. With this press, he was able to publish the very first siddur/prayer book in America (a Sephardic one, catering to the majority of the Jews in the U.S. at the time, who were of Spanish and Portuguese descent), as well as the first Passover Haggada. He also started the first Jewish periodical in the U.S, a magazine called ‘The Jew’. 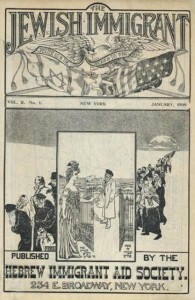 This magazine was primarily an anti-missionary journal, published to counter the dramatic wave of missionaries that targeted poor immigrant Jews for conversion. At the time, approximately 3000 Jews were already living in the U.S., with many more arriving on its shores each day. The magazine thus helped disseminate information that prevented countless Jews from leaving behind their religion, traditions, and heritage. He was also an active leader in a nascent organization called Hevrat Hinukh Na’arim, which strove to promote Jewish education in America. In 1837, Jackson started a movement to bring more Jews to America (saving many from persecution in Europe), and settle the vast expanses of virgin land in the New World. He passed away in 1847, having built a strong foundation for Jewish life to flourish in the United States. You speak of what you need, but you say nothing of what you are needed for. This entry was posted in Writers & Thinkers and tagged American Jews, Education, England, English Jews, Great Britain, Haggada, Hebrew, Immigrants, Jewish Education, Jewish Magazine, Missionaries, New World, New York, Pennsylvania, Portuguese, printing press, Sephardic, Sephardic Jews, siddur, Spanish, The Jew, United States on May 14, 2013 by Jew of the Week.